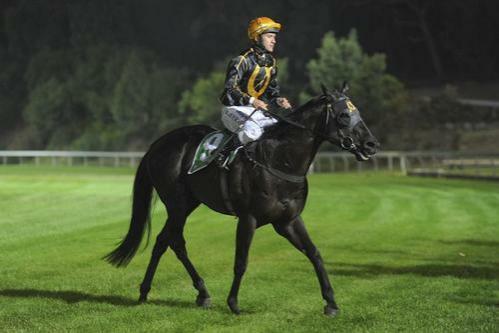 MICHAEL Trotter became the first local trainer to taste success under the bright new lights of Cranbourne when his promising three-year-old colt, Kaitoa, scored an impressive victory in the $15,000 BOQ Frankston Maiden Plate (1400m). Despite taking seven starts to break his maiden status, the son of Econsul looks set for bigger and broader questions with Trotter’s long-term goal being the $300,000 Group 1 South Australian Derby (2500m) at Morphettville on 5 May. Trotter has always had a high opinion of Kaitoa and is unfazed by the potential jump from a Cranbourne maiden to the dizzying heights of Group 1 competition. “Look, he’s always shown ability and was pretty stiff not to win at his first preparation,” Trotter said. “He ran in the Stutt Stakes (Group 2) against some pretty good gallopers and got held for a run and still didn’t finish far off them, so we knew then we had something that could run alright. Friday night’s win was Kaitoa’s second start this preparation after a disappointing first-up run at Bendigo where he finished seventh, beaten six lengths. Trotter was confident leading into Bendigo after Dunn returned with rave reviews at a pre-race trial. Jockey Luke Currie gave Kaitoa a patient ride on Friday night, sitting just off the speed, before working into the race turning for home. The up and coming stayer finished powerfully in the shadows of the post to win by a half-length from Striking Image with the Ray Besanko trained Del Cavallo back in third place. Kaitoa has pulled up well from last week’s run and will now head to Moonee Valley on 23 March for a three-year-old 1600-metre race. Meanwhile, Trotter was effusive in his praise for night racing at Cranbourne and the benefits it will bring to the region. “I just think it’s fantastic,” he said. “Cranbourne should really benefit from this and it’s just made racing accessible to people around the area.